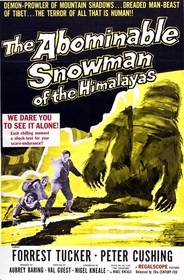 The 1957 Hammer masterpiece of suspense and building tension The Abominable Snowman (AKA The Snow Creature and The Abominable Snowman of the Himalayas) is a perfect example of why Hammer is so highly regarded and why Peter Cushing is a legend. The story, aside from being a wonderful and often genuinely thrilling adventure yarn, is also the tale of two men. Both have diametrically opposed world views, but both are equally driven. Dr. John Rollason (Peter Cushing) is a soft spoken and highly intelligent man of science. The British botanist and his wife are studying rare plant life near a Buddhist monastery in the Himalayas. Dr. Tom Friend (Forrest Tucker) is a tough talking, no nonsense, American who has come to these mysterious mountains on business of his own. Rollason is determined to uncover evidence of the mythical Yeti. Following Darwin's theory that a pre-historic race of primates split into two distinct species several million years ago. One group went onto become the great apes and the other became man. Rollason believes that the Yeti represents an, as yet, unconfirmed third offshoot of the early primates. With only the noblest goals in mind, like the betterment of man's knowledge, he is eager to go against his concerned wife's pleas and join Dr. Friend's expedition into the mountains. Dr. Friend, claims to have new evidence of the Yeti's presence in the area, a relic from the monastery that opens to reveal a giant tooth that could come from no known animal. As the story progresses, we learn that Friend is not at all as high minded as Rollason and that he is, in fact, only involved for commercial gain and that he plans to hunt the Yeti in hopes of displaying his find to the world for a price. Rollason doesn't discover Friend's true motives until their small expedition is well underway. Forced by his own desire for knowledge and hampered by the fact the Friend is the one who knows where strategic cashes of food and supplies have been previously stored along the torturous path through the mountains, Rollason must continue with the man he is growing to distrust. The tension between the two men, brought out wonderfully by both excellent actors, and set against the harsh weather and unforgiving nature of the Himalayas, gives this movie a feel of desolation and unease. On top of the great character work and intelligent script, is the Yeti in question. In a budget conscious effort save some money, no full body make-up was ever created for the beast. All we ever see of the creature are its hairy and wickedly clawed hands and large footprints. When the whole thing is shown, it is always in shadow or obscured by driving snow. Instead of looking cheap, this technique goes a very long way in making this movie scarier than it would have otherwise been. In one scene we see the creature's hand creeping under the side of a tent. We see the terrified face of the man inside. Next the scene changes to the two main characters, who are standing some distance away from camp. We hear the Yeti's inhuman howl and the man's insane scream. The two main characters rush to the tent to find the screaming man almost comatose with fear. This scene is infinitely more effective than I can reproduce here and it is much more effective by not revealing the true form of the monster. I can't say enough good about this movie. There really aren't any downsides to it. The story, actors, setting, writing, and direction of this movie is nearly as good as we humble horror hounds can ask for. 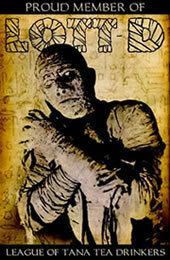 If you are looking for some truly classic horror and a good adventure tale to boot, you can't do much better than this. The Pyrenees Mountains stood in for the Himalayas. Submitted by Spitfire (not verified) on Wed, 2013-10-16 02:11. You are so right. I love this film so much. Definitely the best Yeti movie of all time. It works at every point. The suspense, the imagination, the characters with their motivation and the respect of the subject Yeti; all fits perfectly. Submitted by Mircalla234 (not verified) on Wed, 2015-05-20 08:13. This is an excellent review which perfectly summarises an excellent classic horror movie. Thank you so much!